It has always been common sense for organic growers that the oxygen and carbon dioxide balance is enhanced naturally when the soil is allowed to live and breathe. Soil is a living, dynamic matrix that feeds and recycles liquids, gases and solid matter. Hence it is food for microbes, insects, animals and plants. A recent major report from the Soil Association reviewing the research on soil carbon found that soils under organic management have 28 percent higher levels of carbon than conventionally farmed soils in Northern Europe, and 20 percent higher in the rest of the world. According to the Organization for Economic Cooperation and Development, Japan is one of the world’s leading users of chemicals to grow food. Yet, this situation has only been the case for the past 30 years, less than one generation of farmers. The top soil is currently a dead, or at best a null, environment. The microbial activity, the oxygen, nitrogen, carbon and water cycles are low, slow to enact, or non-active. Chemicals need to be added to stimulate any growth cycles in this matrix. This slow carbon absorption rate is further exacerbated by carbon and lead expelling machines and tractors. The atmosphere around our fields is filled to overcapacity with exhaust from cars, factories and energy production facilities, meaning that the dead soil has further levels of chemicals poured into it every day. The exposure of open soil to all this pollution, which happens for months at a time during non-growing seasons, also further exacerbates the loss of microbes and diminishes absorption abilities. In this depleted substance, we grow the food for our children. The good news is that the Soil Association report shows that, under organic management, soils can provide carbon sequestration of 2 tonnes per hectare per year. That, for the UK alone, would mean the sequestration of 64 million tons of carbon over the next 20 years — the same as taking a million cars off the road. In the UK, that would translate into a 23 percent cut in emissions by the agricultural sector, rather than the 6 percent proposed by the current UK Government. Similar action on organic farming at a prefectural level would help the current Japanese government to reach its proposed target of a 25 percent cut in CO2 levels that was proudly put on the world table by Prime Minister Yukio Hatoyama. Organic soil making is an industry waiting to boom in Japan and the ageing agricultural workforce is waiting for a new job. Thirty years ago, human effort made its own soil and its own fertilization from leaf and vegetable matter, and animal and human wastes. It`s time to revive an old craft, for many good reasons. Beyond soil management, a low carbon farming system would be more diverse for human and non-human food growth. It would incorporate more perennial plants, open pollinated, heirloom and native seeds that enhance biodiversity and DNA strength. Currently, varieties of Japanese vegetables and native species are lost daily because farmers plant only the seed supplied to them by Japan’s agriculture cooperatives and no longer plant local seed that has its own unique taste and growing cycles. Fortunately, many farmers grow their own family supply of food without chemicals, separate from the food grown on their own farms. These country gardens still hold local seed varieties and heirloom seeds passed down from previous generations. We have around 10 years to gather them and pass them onto the next generation to maintain better nutrition and DNA diversity. After that, the current older farming generation will no longer be here and the seeds and soil secrets will pass away along with them. We need to plant local seeds into locally grown soils and sell the food locally. We need to reduce actions like growing food in Okinawa and air freighting it to Tokyo. We should grow food organically in Tokyo and deepen the garden of food we live amongst. Further, if we want to reduce the carbon footprint of food, we must start by tackling the fact that 50 percent of what global agriculture produces is thrown away. A shocking 20 million tonnes of food products are disposed of annually. In fact, much of it tossed out by farmers even before it reaches the supermarket in order to maintain higher food prices in cases of excess supply. There are very few organizations like Second Harvest Japan who re-distribute unneeded or imperfect food to people who will use it, or my own john moore organics organization that runs a Food Commons offering surplus food to people in exchange for their commitment to create a better tomorrow. These actions may not yet threaten corporate interests in the nation’s food market, but they do enhance people’s respect for the texture and experience of food. Unfortunately, such initiatives are not numerous in Japan and they barely make a dent in the huge problem of food waste and the energy-intensity of Japan’s food. There are various simple ways to reduce the vast quantities of importing and exporting of produce that could easily have been grown close to the consumer. This is something that would reduce the amount of CO2 that finds its way into not just the atmosphere, but also into our soils and food everyday. Simply put: soil, grow your own. Japan`s wonderful climate makes this happen within weeks and the necessary leaves, insects, microbes and vegetable matter is abundant and cheap, if not free. But how do street and parks maintenance crews dispose of all the leaves and branches that are cut every season? 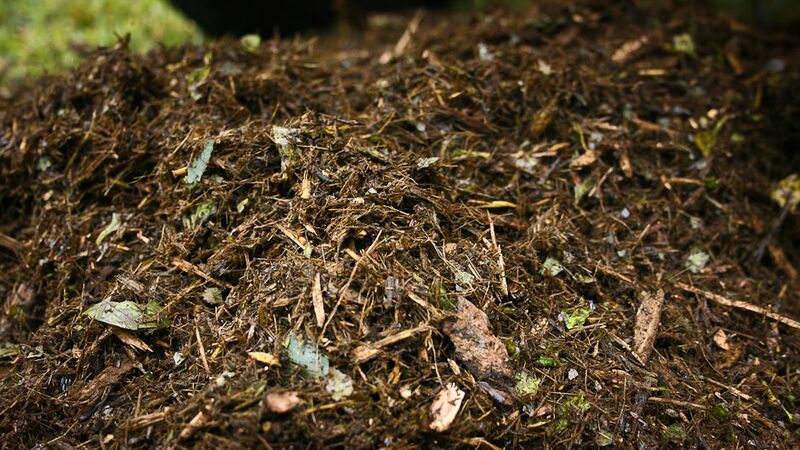 In municipalities around the developed world, this precious organic matter is plastic bagged and trucked away from the soil. Those valuable leaves are not being used to help produce carbon digesting organic soils! So why not begin by doing as we do in the Shimomeguro area of Tokyo? Grab as much as you can use to make your own food garden soils. To get started, check out the work of the Rodale Institute and the information in the ‘How this affects you’ sidebar of this page to get started. The Secret is in the Soil by John Moore is licensed under a Creative Commons Attribution-NonCommercial-ShareAlike 3.0 Unported License. John Moore is creator of John Moore Organics in Japan and has grown organic food for 45 years. He grows soil and seeds on six organic farms in Japan to produce organic deli food for sale at the UNU Farmers Market and cafes in and around Tokyo. He holds organic growing workshops that encourage people to grow food in their own apartment, balcony garden or farm, as well as monthly seed exchanges. Excellent argument and recommendations, John. Your words (and track record) inspire action…many thanks for that. And given your description of the Japan’s farmers planting coop-supplied seeds and such, it’s so ironic that in decades past right there in Japan as you obviously know, the venerable ‘father’ of natural farming, Masanobu Fukuoka, proved quite convincingly that soil without inputs resulted in higher yields, to say nothing of better tasting and more nutritious food! Oh, and a healthier ecosystem, and biodiversity, and a more sustainable and resilient lifestyle, etc., etc. In his time he was clearly tilting at windmills, but now I’m sure he’d be pleased with your efforts. I’m also pleased to report that his classic book, One Straw Revolution, has recently been re-printed, too, for those who’d like to partake in some literary refreshment. What a great read. Ten years remaining, you say, to gather the remaining heirloom seeds. That IS sobering, and lights a certain fire in one’s pants (or should). Edo and really must now get my hands on it! Very good article. But again, the main reason for the problems become just more obvious: The Monetary System. And the possible answer should be discussed around the world by now: a Resource Based Economy (http://www.theresourcebasedeconomy.com/). A world WITHOUT money and property, but where everyone has access to everything needed. No, not communism. Check it out before criticizing. A resource based economy is proposing a world without governments, borders, class stratification….and money. It would be a world where the planet’s resources are considered the heritage of Humanity, and will be developed accordingly. Why are farmers throwing food away? Because, as the article says, they need to maintain higher food PRICES. With a system with no money, this would of course be totally unnecessary. In a global system without money there would be no need to think about price. What would be thought about would be the best possible solutions and products for all people. And what this article states so fitting, is the importance of FOOD and natural growing methods. Of course The Monetary System DOES NOT WANT natural growing methods. Why? Because so much MONEY is earned on chemical fertilizers and pesticides. Not to speak of selling ONE type of seeds. ALL of the problems stated in this article has become as a result of the monetary system. A resource based economy is far from perfect either, but what alternative do we have? Nature really gives us abundance in a natural way, and almost for free. It is clear that the monetary system can not MONETIZE on a world where everyone lives ‘for free’, enjoying their own home grown food. This is why The Monetary System HAS TO GO. The Monetary System combined with the egoism and greed it produces is a system that simply eats the world until there’s nothing left. It is not a sustainable system. Are you saying that it is egoism and greed that came before the Monetary System? That might well be, but now we’re all a slave of this system, and it is so to say impossible to get out. Everyone today HAS to think ‘profit’ or ‘income’ in some way or another. Unless you live totally independent on your own island. The profit motive is a part of all of us, and it is due to The Monetary System. It is not necessarily ‘human nature’. Without ‘the money troll’ breathing in our necks, a lot more people would be a lot more giving. Just think how wonderful it would be not to think about money for once. Just live. Of course, we do that now and then within today’s system as well. But with the work we have, we HAVE to think profit, or else we’re doomed. Within another system, a Resource Based Economy, we could free our minds to REALLY develop stuff to the best for Humanity.